Hydronic heating system uses water or steam to carry the heat required to heat up the buildings or homes. The most common system used is the one using water that is heated up to a temperature of 200°F (93°C). The water that is heated up is then circulated throughout the rooms by using centrifugal pumps. These pumps are also known as circulators and have impellers that spin and force the water to be distributed through the system. The hot water is then radiated to the room by the use of terminal units. 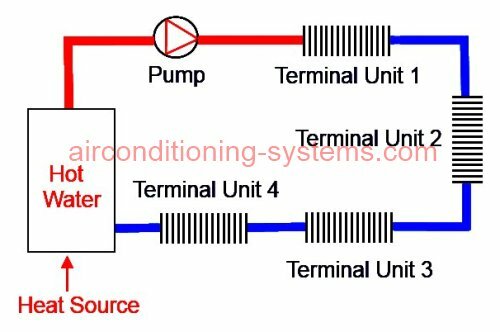 There are many design of terminal units. One of the commonly used is known as the radiator (finned-tube baseboard). 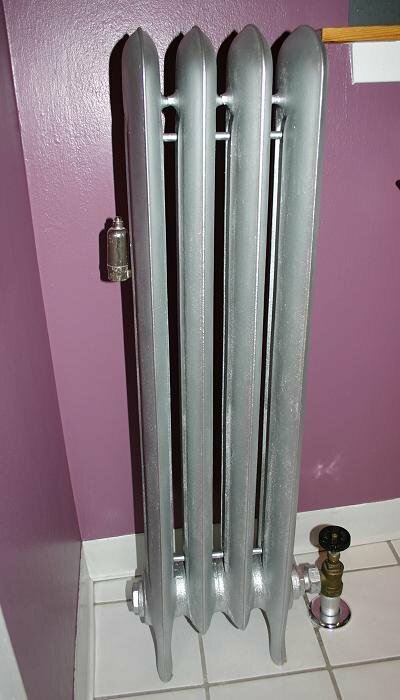 This radiator has finned tubing that increases the surface area between the radiator and the air. Remember that hot air rises up and cool air settle down. Cold air from the room passes through these fins from the bottom and is heated up before being released by convection to the room. Typical dimensions of a radiator is 2 feet X 8 feet. The other terminal unit which is now commonly used in new buildings is the fan coil unit. The fan coil unit also consists of fins which are usually made from aluminium. In the case of fan coil unit, a fan or blower is used to circulate the air from the terminal unit to the room. The forced-air circulation by the blower instead of using convection helps to heat up the room in a faster rate compared to the conventional radiator. The cooler water from the terminal units is then returned to the heat source to be reheated and recirculated. This illustration is the most simple concept of a hydronic heating system. Here are a greater detail of the various components that make up this heating system. Many of the components are necessary as hot water or steam can be dangerous if not properly controlled. The Boiler is the most basic equipment that is used to heat up the water. If you go to a hotel or any commercial buildings, you will probably see a boiler at the back of the building. One way to identify it is the steam that comes out from the boiler. These boiler is usually filled with water automatically from the pipe when the level of water dropped. The water is heated up using electricity (Electric Boiler), gas (Gas-Fired Boiler), oil (Oil-Fired Boiler) or a mixture of them depending on their availability. Depending on the design or settings, the temperature of the water can be heated up from 90°F (32°C) to 200°F (93°C). Here are the three most common type of boilers. In recent years, the geothermal heat pump is becoming increasingly popular due to its efficiency. The heat source is obtained from the earth, lake or pool. Heat is extracted from these sources using the vapor compression system and used to heat up the water to temperature as high as 130°F (54°C). Besides the boiler, other components that make up the hydronic heating system include the followings. Expansion Tank is used to contain the extra volume of water which is created when the water is heated. Compression tank or standard expansion tank are the most basic tanks that are used. Centrifugal Pumps or also known as circulators are used to circulate the hot water from the heat source to the terminals located in the rooms and back. Impellers are connected to the motor by linkages system which are rotated at high speed once the motors run. Most of the impellers are made from bronze or non-ferrous metals to prevent corrosion. Air Separator is needed to separate the air that is trapped in the piping circuit. Air must be removed from the piping as it can cause corrosion in cast iron or steel boilers. The wire screen in the air separator traps the air bubbles as the water passes it. When the bubbles trapped becomes bigger in size, it will eventually travel up into the air vent which discharges the air from the system. Air Vent is needed to remove the air from the system. This simple device is usually located above the air separator. It can be automatic or manual type. The automatic type is more convenient as these vents will automatically open and close when necessary. High Limit Control is a safety device that will cuts off the power to the heat source if the temperature of the boiler rises too high. For example, if the water temperature at the boiler is set to 160°F, this device may be designed to cut off the power to the heat source when it detects a temperature of 180°F. Water Regulating Valve or Pressure Reducing Valve is used to automatically add the water into the system if it detects that the pressure is not right. Low Water Cutoff is a valve that will cut off the power from the boiler if the water level drops below a pre-determined level. Pressure Relief Valve is used to discharge excess water when pressure is created by expansion.